Gorgeous Sparkly Genuine RED Diamond Set in 14k Solid Yellow or White Gold, or Sterling Silver Our beautiful shiny handmade Nose stud features a beautiful sparkly 2mm Genuine RED Diamond that sparkles amazingly in the light. Our diamonds are so gorgeous because we use only quality diamonds. This listing features a beautiful SI RED Diamond. This diamond is .04 Carats, approximately 2mm wide. We use 100% conflict free diamonds. 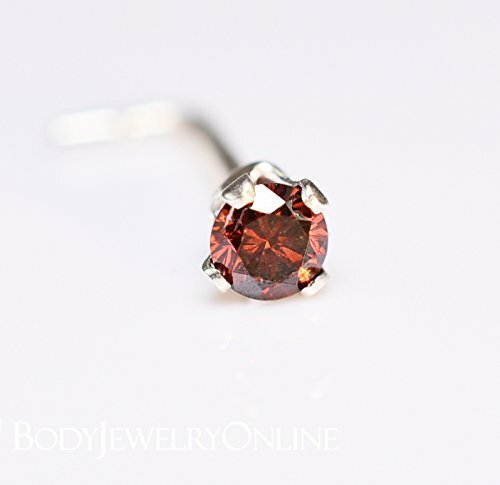 This listing features a single beautiful RED Diamond stud which can be used in any gauge appropriate piercing, including the nose, helix, tragus, cartilage, lip, anti-tragus, monroe, ear lobe, etc. Many different types of gauges and backings are available including a fishtail, straight post with rubber hypoallergenic backing (or gold or silver matching backing for a small extra fee), L-post, screw shape, push in bioplast flat back, solid gold screw in flat back (for an extra fee), bone, etc. The L-post is 6mm from the back of the stone to the bend, and 4-5mm from the bend to the end of the post. We also offer screw shaped posts, that are 6mm deep as well. We can also make a bone, or straight post with a hypoallergenic rubber backing. Our Bone post is also 6mm deep. If you are ordering solid yellow gold post and would like a different gauge post, please ask if there is a price difference ahead of time before ordering! Thanks! Sterling Silver and 14k Yellow or White Gold Screw in flat backs are also available for an extra fee (18ga, 16ga, and 24ga). Please contact us before ordering if you are interested in a metal screw in screw back and we will put up a special listing for you. We have other color and size diamonds available as well. We have diamonds that are white, yellow, blue, green, red, orange, pink, brown, purple, teal, cognac, champagne, black, etc., and any size diamond you can think of. Please let us know if you would like us to put up a listing for something else. If you have any questions about this product by Body Jewelry Online, contact us by completing and submitting the form below. If you are looking for a specif part number, please include it with your message.